$200.0 1847 Rogers Bros FIRST LOVE service for 12 w/ Wood Chest Very Nice! $219.95 1847 ROGERS BROS. FIRST LOVE SILVERPLATE FLATWARE SET - CA 1937 - 72 PCS. $269.95 Rogers Bros 1847 International First Love Silverplate Flatware Set 60 pcs. 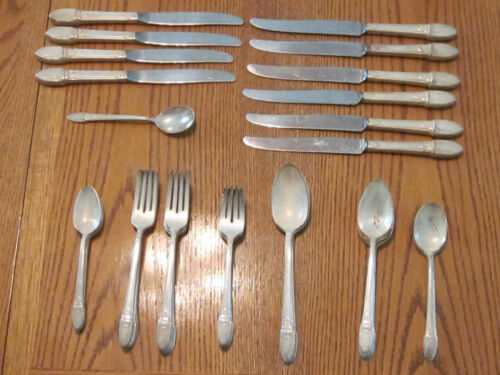 Buy: $300.0 Rogers Bros 1847 International First Love Silverplate Flatware Set 52 pcs. $195.0 First Love by 1847 Rogers Plate Silverplate Punch Ladle Hollow Handle 16"
$29.98 1937 FIRST LOVE 12 Dinner Knives 1847 Rogers Bros - 9 3/4"
$28.88 1937 FIRST LOVE 8 Dinner Forks 1847 Rogers Bros - 7 3/4"
$74.36 RARE First Love by 1847 Rogers Silverplated Hollow Handled Soup Ladle 10.75"
$34.99 First Love Silverplate Place Oval Soup Spoons Qty.7 7 1/4"
Buy: $22.0 First Love 1847 Rogers Bros. IS Large Serving or Berry Spoon 9"